Playa 506 kohteessa Puerto Viejo, Costa Rica: Varaa nyt! Note: The Hostel is growing, during the month of July there will be a construction going on.We apologize for the inconvenient and we promise there won´t be any noise early in the morning. 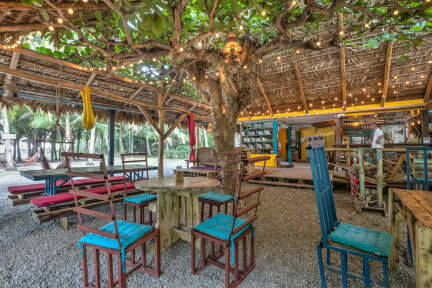 Welcome to our unique style beachfront hostel and bar in Costa Rica. Located on Playa Cocles, 2 km from the town Puerto Viejo. Come to experience the wild nature and local culture. You can enjoy a drink in a hammock, listen music at the beach and meet new people. We also offer 7 privates rooms for 2, 3 and 4 people. - Room B & H: Full size bed, fan, shared bathroom, community kitchen. - Room C: 2 twin beds, fan, shared, bathroom, community kitchen. - Room F: Full size bed mezzanine style reachable by stairs, and one twin size bed, A/C, shared bathroom, community kitchen. - Room G: Full size bed, and one twin size bed reachable with ladder, A/C, private bathroom, community kitchen. - Room S: Full size bed, and a bunked, A/C, shared bathroom, community kitchen. - Room W: Two bunk beds, fan, shared bathroom, community kitchen. For a 'under stars' experience camping is available in our property ( $25 for each tent max 2 people). Campers can use our facilities, breakfast included. - A fully equipped kitchen is available for those who wants to cook or store food in the refrigerator . - The breakfast is included, served at the restaurant from 7:30 am to 10:00 am (Eggs, Gallo pinto, bread, butter, jam, fruits, coffee and tea). Eat, drink, play and stay with us! Enjoy our backyard beachfront oasis with original cocktails recipes with fresh herbs and exotic ingredients from the area. Our food menu includes local favorites such as hummus with pita, guacamole with plantain chips, fish and chips, house salad, ceviche, panino caprese, fish sandwich, veggie burger, mushroom risotto, home made ravioli, whole fried red snapper, tuna steak and more! We offer different activities and tours, for which you can ask at reception. Every Sunday we have our DJ set where we play the music we love. Grab a drink and come dancing on the beach.. A visit with us will sure complete your Costa Rican trip. Once you are in Puerto Viejo the best way to get around is by bike, you will be able to rent a bike directly with us. This is the traditional way of getting around here keeping with the Eco friendly attitude. Such a amazing looking hostel with great beach and best dormbeds ive ever seen.